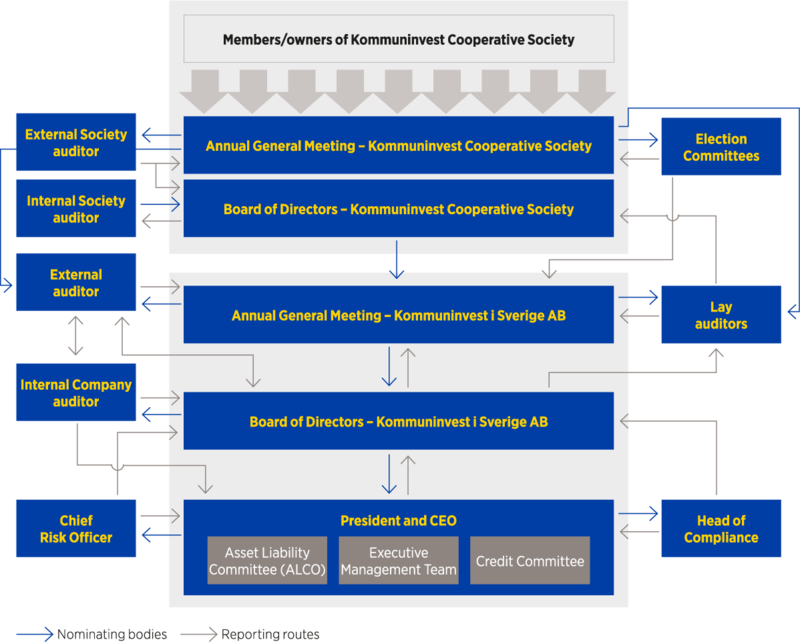 Kommuninvest i Sverige AB (the Company) is a Swedish public limited liability company and a wholly-owned subsidiary of the Kommuninvest Cooperative Society (the Society). Good governance and control are crucial to the Company, as it is owned by Swedish municipalities and county councils/regions and has a public mandate. Together with the Society and Kommuninvest Fastighets AB, the Company forms a financial group of companies – the Kommuninvest Group (the Group). Since the Company issues debt instruments that are listed for trading in a regulated market, the Company is legally bound to present a corporate governance report. However, since the Company’s shares are not traded on a regulated market in Sweden, it is not bound by the Swedish Code of Corporate Governance. The particular nature of the operations is also deemed to be such that neither the Swedish Code of Corporate Governance nor the Principles for the Governance of Companies Owned by Municipalities and County Councils, developed by the local government sector, should be applied on a voluntary basis. The regulations that the Company must primarily apply with regard to corporate governance are the Companies Act and the Annual Accounts Act. The Companies Act includes basic regulations regarding the organisation of companies. These include the requirement for a Board of Directors appointed by an Annual General Meeting. In turn, the Board of Directors appoints a Chairman, who is to lead the work of the Board, and a President, who is responsible for ongoing management in accordance with the Board of Directors’ guidelines and instructions. The Annual General Meeting shall also appoint an auditor to monitor operations and check the accounts. As a credit market company, the Company must adhere to the Banking and Financing Business Act and the general advice and regulations issued by Finansinspektionen (Swedish Financial Supervisory Authority) and its equivalents within the European Union, the ESAs (European Supervisory Authorities). The members of the Society are Swedish municipalities and county councils/regions. The Society is a cooperative venture with the principal purpose of providing members and their majority-owned companies access to cost-efficient and stable loan financing. According to its Articles of Association, the Society shall not be operated with the purpose of generating profit. Once consolidation needs have been satisfied, all surpluses shall accrue to the members. The members themselves determine the focus of the operations and no individual member has any decisive influence in isolation. At the Annual General Meeting, each member has one vote. Presented below are some of the principles on which corporate governance is based. Additional to these are the formal work plan for the Board of Directors, the instructions to the President and other internal regulations adopted by the Board of Directors. The Board of Directors of the Society develops directives for the Company and these are set annually at the Annual General Meeting. The owner directives set out the framework of the operations assigned to the Board of Directors of the Company by the Society. The owner directives primarily include guidelines regarding consolidation, risk levels, remuneration principles, principles for business travel and representation, expertise on funding matters, development of products and services and any special assignments set for the Company by the Society. The owner directives are set annually by the Annual General Meeting of the Company. The Company’s overarching objective is to generate the greatest possible benefit for the members of the Society. Among other measures, this shall be achieved by maintaining a high proportion of satisfied customers, accounting for a large proportion of members’ loan financing, maintaining a high level of cost efficiency and having the financial strength to support the long-term focus of the operations. Follow-up against the targets are presented on page 5. The Board of Directors sets the remuneration principles applicable within the company. Remunerations shall engender conditions to attract, retain and motivate employees so that operations can be conducted in an optimal manner. The basic principle is that remunerations and other terms of employment should be in-line with the market, however not at the higher end, and should consist solely of fixed wages. No variable remunerations are paid. Wages are set taking into consideration the tasks involved and their degree of difficulty, responsibilities, educational requirements and how the employee fulfils the demands imposed and contributes to improvements in operations. The Society owns all of the shares in the Company and exerts its influence at the Annual General Meeting. The Annual General Meeting of the Company was held on 10 April 2014, in immediate connection with the Annual General meeting of the Society. The Annual General Meeting of the Company approved the Annual Report for 2013 proposed by the Board of Directors and the President, and discharged the members of the Board of Directors and the President from responsibility for the year. Furthermore, the Annual General Meeting approved the distribution of earnings proposed by the Board of Directors and the President. The entire Board of Directors was reelected by the Annual General Meeting. Ellen Bramness Arvidsson was reelected as the Chairman of the Board. Authorisation for the Board of Directors to implement new share issues during the financial year. There is an election committee for the Society’s companies, Kommuninvest i Sverige AB, Kommuninvest Fastighets AB and the associated company Administrative Solutions NLGFA AB (Nordic Local Government Funding Agencies). The Election Committee bears the ultimate responsibility for the preparation of appointment decisions through a structured and transparent process allowing the shareholder to give its views on proposals and to submit its own proposals regarding appointments and associated issues, thereby establishing favourable conditions for well-founded decisions. The board composition shall, in accordance with the election committee’s instructions, reflect the nature, scale and complexity of the operations. At least one board member shall be a present or former elected trustee in a member municipality or county council, and possess knowledge about the local government sector and the political process. The Election Committee of the companies owned by the Society shall represent the Board of Directors of the Society and consists of members elected by the Board from its own membership. The Board of Directors of the Society has resolved that its working committee shall act as the Election Committee. The Board of Directors of the Company bears the ultimate responsibility for its organisation and management. Each year, the Board of Directors establishes a formal work plan that, among other things, regulates the Board’s tasks, reporting to the Board, the number and regular contents of Board meetings, and the assessment of the work of the Board of Directors and President. Furthermore, the Board sets objectives and strategies for operations, is responsible for identifying and managing risks, and ensures that operations are conducted in compliance with the predetermined objectives. The Board is also tasked with preparing internal guidelines including a reporting policy that states what reports are to be produced within the Company. The full Board is responsible for completing the tasks otherwise assigned to an audit committee. The rules of procedure are reviewed and adopted at least once a year. The Board consists of eight members representing a broad skills base in areas such as public services, the capital markets and business development. The Chairman of the Board is responsible for the work of the Board of Directors being well organised and efficiently conducted and for ensuring that the Board fulfils its tasks. Among other things, the Chairman is required to encourage an open and constructive discussion among the Board, to ensure that the Board continuously updates and deepens its knowledge of the company and its operations, to ensure that the Board has rules for identifying and dealing with conflicts of interest on the Board, and for receiving comments from the owner association and disseminating these within the Board. The Chairman of the Board shall also check that the Board’s decisions are implemented efficiently, ensure that the work of the Board is evaluated annually, and act as a discussion partner and support for the President of the company. The Chairman of the Board is also responsible for ensuring that the Company’s remuneration policy is independently reviewed and for monitoring the application of the Company’s remuneration policy. The Board of Directors has adopted a set of instructions for the President and Chief Executive Officer, detailing his tasks and responsibilities. The President is to deal with the ongoing administration of the Company in accordance with the Board’s guidelines. This includes drawing up a proposed operations plan, budget and annual/interim accounts. The President is also responsible for appropriate systems and procedures being in place for reporting the financial situation and position to the Board, for operations being conducted in adherence to regulations and for setting guidelines and instructions regarding the various risks that arise in the operations. During 2014, the Board of Directors of the Company consisted of Ellen Bramness Arvidsson (Chairman), Lorentz Andersson, Kurt Eliasson, Anna von Knorring, Catharina Lagerstam, Anna Sandborgh and Johan Törngren, as well as the employee representative Anders Pelander. The members are presented on page 37 of the Kommuninvest annual report 2014. The Chairman of the Board of Kommuninvest i Sverige AB received a fee of SEK 400,000 (400,000) for 2014 as determined by the Annual General Meeting. Other Board Members received a fixed fee of SEK 100,000 and a variable fee of SEK 10,000 per meeting as determined by the Annual General Meeting. The combined fees are detailed in the table on page 38. The total fees paid to the members of the Board of Directors amounted to SEK 1,615,000 (1,400,000) for 2014.